The club, which runs every Friday in the Dominick Street venue's upstairs bar, is the brainchild of Róisín Dubh co-owner and Comedy Carnival Galway founder Kevin Healy, and local comedian Steve Bennett. It came from a desire to restart regular, weekly, comedy in the venue again, after a period when weekly comedy was scaled back during the economic collapse. However, now the worst ravages of the recession seem finally over, the Clubh was launched in advance of the 2015 Comedy Carnival. "We wanted comedy to be a continuous thing again, that it would not be just the comedy festival and the odd big gig throughout the year, but that there would be a follow-on for the public from all that," Kevin, who has some 25 years' experience of booking and promoting comedy, tells me. For 2016 the club is set to expand again. Not only will the weekly upstairs shows continue, but once a month, the club will move to the larger downstairs live venue, to host big names, with Al Porter, Seann Walsh, Abandoman, and Colin Murphy all scheduled to take part. Laois born, Galway based, comedian/musician Steve Bennett has been steadily making a name for himself as one of Ireland's emerging new comedy talents. 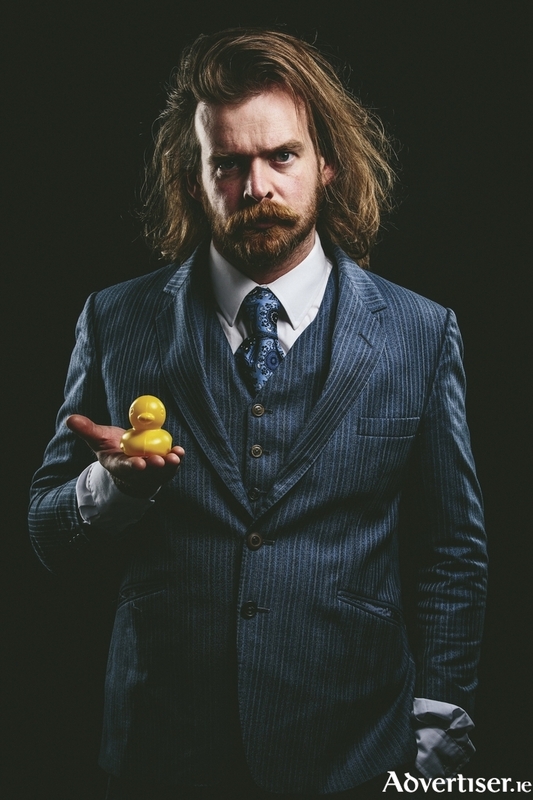 In only a couple of years, armed with just his ukulele, he has twice played the Edinburgh Festival - winning the EdFringe ‘Uke of Edinburgh’ 2013 Award; been positively reviewed by leading comedy website Chortle as "eminently likeable...good natured and inherently funny – a winning combination”; and performed at Body & Soul, Electric Picnic, the Galway Comedy Festival, and the Comedy Carnival Galway. It was Steve who came up with the unorthodox name. "Kevin and I were exchanging emails when I came up with the rhyming pun," he says. "Kevin emailed me back saying, 'I don't get it'. I told him, 'Say it out loud'." Laughs Kevin: "We've often had to keep saying that to people. Sometimes posters have come back from the printers, saying, 'Clubh' is a typo." Steve came to Kevin's attention with the former attending comedy shows in the Róisín and through NUI Galway's Comedy Soc. Steve started to get gigs in the Róisín, and here and there picked up MC duties, before Kevin asked him to help develop and MC the new club. MCing a regular comedy night in a leading venue like the Róisín is a major string to Steve's growing reputation and CV. "It's a real boost," says Steve. "It shows Kevin has faith in me. It's also a chance to constantly develop my skills. As opposed to having a set to rely on, an MC has to be fresh every week, so I can't keep relying on the same thing. As MC you have to talk to members of the audience, slag them off and joke with them, but not in a way that will upset them, you want them to have fun as well. You want to provide the audience with something special." Being the MC gives Steve the opportunity to study other, more established, comedians and become more familiar with their approach. "It gives me a chance to see comedians I would know by reputation, but may not have seen before. The chance to watch people like Joe Rooney and Pat McDonnell was amazing. You can not only see that they are good, but just why they are so good." A key feature of the Clubh's approach is that it gives a platform to emerging comedians, and does not concentrate solely on hosting big names. This further reflects on the partnership between Healy and Bennett, with the former's experience and contacts bringing in the big names and the latter able to raise awareness of interesting new names taking their earliest steps into comedy. "I've shared buses and stages with these guys," says Steve of the new comics, "and the Clubh gives them an opportunity to progress." "People may not have heard of some of the acts that are playing, but audiences can trust us, we know what what we're doing," says Kevin. "These are all names that are worth checking out." "Yes you can be a hipster and come and see them before anyone else has heard of them," quips Steve. In a further show of support for emerging comics, the venue is also launching the Róisín Dubh Comedy Showcase on Tuesday nights at 9pm, which will feature new comedians, and will be hosted in rotation by Bob Hennigan, Johnny Graham, and Eoin Burns. He wears a beard. He doesn't wear pants. His comedy involves little or no speech. He is Northern Irish comic Paul Currie. Galway will remember the Ulsterman at the Comedy Carnival, particularly his support slots for Stewart Lee. Those performances involved outrageous and surreal, mime and action including a sketch with a puppet monkey and the theme from The Deerhunter. Paul, who Kevin compares to "Steve Martin or Monty Python doing stand-up", plays on Friday January 29 in the Róisín's main room. "His comedy is infectious and he's really energetic," says Steve. "It's an hour where there's not much talking, but it's still absolutely hilarious, and really different." Other main venue Clubh shows will be Colin Murphy (February 26 ); Foil, Arms & Hog (March 4 ), with Seann Walsh, Al Porter, and Deirdre O'Kane also scheduled to play later in the year. Abandoman will be dropping by as part of their tour in May, as will Andrew Maxwell in the autumn. As for the regular upstairs gigs, the line-up is John Colleary, Jim Elliot, and Emma Doran (February 5 ); Eric Lalor, Alison Spittle, and Aidan Shields (February 12 ); Colm O’Regan, Keith Fox, and Gráinne McKeever (February 19 ); and Ross Browne and Oisin Hanlon (March 11 ). So that's what is in store for the Clubh in the coming weeks and months, but what about tomorrow night? The emergence of a greater number of women in stand-up comedy over the last 10 years or so has been extremely welcome (as has been the increasing questioning of whether we need to use terms like 'female comedian' anymore ) and a fine example of this phenomenon is Scottish comic Fern Brady [pictured above]. The award-nominated Fern has appeared on 8 out of 10 Cats, Stewart Lee's Alternative Comedy Experience, or Seann Walsh's Late Night Spectacular. The Scot enjoyed a critically acclaimed run at the Edinburgh Fringe for her debut solo show People Are Idiots, and she has enjoyed much critical acclaim. Scotland on Sunday praised her "fearsome originality"; The Guardian said she displays "gerat comic sensibility with moments of sparkling verve"; while Stage said, "Wicked, close to the bone gags and a classy poise shows she's no stranger to the stage". Support is from Sean Nolan, winner of the RTE’s New Comedy Awards, whose one-liners pack a punch, and The Lads of Comedy's Trevor Browne. In another new development for the Clubh, it is starting a loyalty scheme, akin to the loyalty cards in coffee shops - attend four Comedy Clubs and admission to the fifth night is free. The cards will be available at tomorrow's show. Fern's appearance at the Clubh will be her Irish debut. Doors open at 8.30pm. Tickets are available at www.roisindubh.net, the Ticket Desk at OMG Zhivago, Shop Street, and The Róisín Dubh.